S and I had a wonderful time in Vienna. We ate, shopped, drank copious amounts of coffee (einspanners, melanges, kleiners, you name it), ate multiple varieties of cake, and drank fantastic local wine and beer. Instead of recounting our exploits chronologically, I’ve decided it would be easier and potentially more useful to write a simple guide to the Austrian capital, based on our experiences. Thus, the below is by no means in-depth or meant to be the “guide to beat all guides”; it just represents the places that we loved visiting. I’ve also, given the food focus of this blog, left out descriptions of the various museums, galleries and other cultural institutions that we went to. These–especially the MQ (MuseumsQuartier) and the newly renovated Mozarthaus–were excellent and not to be missed. But you can find info on those places somewhere else. Fans of uber-designer hotels will love Style. It’s sleek, modern and ultra hip. The lobby and the rooms are plushly decorated with a warm cream and brown palette, perfectly accented with striking red touches. The rooms are incredibly comfortable and there’s wireless Internet throughout the hotel–vital for today’s travelers. The lobby bar is always hopping and the minibar’s contents are complimentary (i.e. the cost has been included in your room rate). The hotel is also perfectly located, sitting opposite Café Central and just 2 minutes from the Graben, one of the city’s main pedestrian shopping streets (which leads directly to St Stephen’s). Unfortunately, rooms here are pricey and the staff are less than “with it.” In fact, some times they were quite unhelpful, which to me far overshadowed the great location and stylish rooms. I’m a new and loyal fan of Hotel Altstadt. This 4 star pension, just a few minutes walk from the MQ, is housed in an old 18th Century building–formally an aristocratic home. Owner Otto Wiesenthal has decorated the hotel’s finely restored interiors with a tasteful selection of contemporary art and plush, comfortable and chic retro furniture. We walked in without reservations (having decided that the other hotel we were checked into–the Viennart–was just plain vile) and asked if there were rooms available and if we might have a quick walkthrough. Petra, the reception staff on duty that morning, was fantastic. Charming, warm, and enthusiastic, she gave us a short tour and offered us a great rate. Our room was large and comfortable, with a big, red leather club chair, a comfy double bed, and some cute vintage furniture. There’s also free wireless Internet access here. Breakfast at the hotel (included) was delicious, as was the daily afternoon tea and cake spread (also included). Most importantly, all the staff, young, attractive and charming women, were perfect. This is a hotel I plan on staying at again and would recommend to any friend. Helmut Osterreicher, the chef that made Steirereck Vienna’s most celebrated restaurant, may have left, but with chef Heinz Reitbauer (son of the restaurant’s owner) at the helm, who cares! Chef Reitbauer’s food is gorgeous, better than anything I’ve eaten in a long time and worthy of more than just one Michelin star. In fact, I’m going to go way out on a limb here and say that the dishes there with S were much better than what I ate at Gordon Ramsay in London (which has 3 Michelin stars) last year. The food was perfectly executed, complex yet well-balanced, intelligent, sophisticated, light and delicious. S and I both had 5 course menus. Of course, before menu options are even presented, deft waiters have already presented 3 small tasting portions to wake up and excite the taste buds. My first 2 courses, from the ordered menu, and my dessert were especially inspired. The first course was called Suckling-Pig-Ham & Egg Yolk (a square of gelatinised ham sauce with an egg yolk in the middle served with parsley-spinach and suckling-pig-ham); the second was simply called Trout “Blue” (lovely filet of trout poached in bouillon in a jar with various local herbs). The dessert was Rhubarb & Lemon-Melissa (marinated and cooked rhubarb with lemon-melissa cream, strawberries and cereal crisps). My other two courses were a filet of St. Pierre with pumpkin seed-spinach, sandwiched between thinly sliced white and brown bread and a roasted filet of milk calf with almond-honey shallots. I should also mention one of S’s courses that was surprisingly delicious, a goose liver praline with rose flower-chocolate, lychees and green pepper. We enjoyed our dinner with a lovely bottle of Alzinger (a local, cult Wachau winemaker) Riesling. Steirereck’s location, in one of the city’s most beautiful parks, is also stunning. The only thing, in my opinion, holding it back from 3 Michelin stars is its service, which while good was not amazing. On the back side of Steirereck, there’s the cutest little café-restaurant. Meierei specializes in milk and cheese, specifically farm fresh milk and Austrian cheeses. The restaurant opens up onto a lovely view of the Stadtpark, and its big, glass, sliding doors are kept open during warm weather–making it the perfect place for lunch. The range of milks is interesting, everything from fresh cow’s milks to sheep’s and goat’s milks. Even soy milks and coconut milk. The one pictured above is a cow’s milk served warm with bitter chocolate, orange and ginger. The 60+ cheeses available here are fantastic. And each is served with a small piece of paper with a typed description. While I had a sampler of Austrian cheeses, S had their “Cheese Duel”, a plate of 4 top French cheeses matched against 4 top Austrian cheeses. In addition to the cheese selection, Meierei also serves some simple Viennese fare. Dessert addicts will want to get a table a little before 2pm, because at 2pm, 2 freshly baked apple strudels are brought out, still warm from the oven. The day we were there, all slices were snapped up in less than 10 minutes. Osterreicher, helmed by famed chef Helmut Osterreicher and located in the MAK (the museum of applied arts), has been open for a little under 2 months. It’s also THE restaurant of the moment in Vienna and, according to friends, the toughest reservation to get in town. Built in a large extension of this century old building, the restaurant and adjoining bar are stunningly designed. While preserving the historical beauty of the room, modern furnishings and fixtures–like a truly amazing glass-bottle chandelier–have been introduced. Old meets new on the plate as well as in the interiors. Osterreicher’s menu is divided into two halves. One the left, patrons are offered traditional Viennese dishes. On the right are Osterreicher’s modern reinterpretations. The food is good. It’s very simply plated and very fresh. It’s nothing as fancy as the food at Osterreicher’s previous restaurant, but this new place is not meant to be fancy. It’s meant to be the kind of place you might drop by a couple times a week, for a drink and a bite. Plachutta is Vienna’s most famous Tafelspitz specialist. Tafelspitz, for the uninitiated, is a traditional Austrian dish of slices of beef boiled in bouillon and root vegetables, served with fried potatoes, a horseradish sauce, an apple sauce and a variety of side dishes like creamed spinach. Traditional Tafelspitz uses aitch bone of beef but the restaurant also offers at least a half dozen other cuts to choose from. While touristy, a visit here is a must and the specialty is surprisingly delicious. There are now a couple branches of this very popular restaurant, but the one to eat in is the first branch, on Wollzeile. The restaurant is packed and noisy. And it’s essential to book a table. S and I had read that Figlmuller, just off Wollzeile and near St Stephen’s, was THE place to eat Wiener Schnitzel. They have two branches, an older, tiny place brimming with ambience and a larger, less charming space. We chose to go to the smaller, older branch. Which meant, since we arrived without reservations, a long wait. The schnitzel here is pretty good, pounded thin and served in giant-sized portions; each serving is so large it dangles over all sides of the plate. The service, however, is surly. This tiny, humble little hole in the wall owned by two sisters, just a short walk from the MQ, is also known for its schnitzel. And I have to say that if I were to pick between Figlmuller and Zu den Zwei Lieseln, I’d pick the latter without hesitation. While nowhere near as charmingly furnished, the schnitzel served here is simply better. It’s thicker, juicier and tastier. And cheaper. S and I had read about Una in the Time Out Guide to Vienna. The review said that it had “the best address in the Museumsquartier” and described its gorgeous vaulted ceiling, “clad in Turkish tiles.” But the review didn’t say that much about the food. Fortunately for us, we met Chef Una’s mother (Henny Abraham, see “Where to shop” below) who offered to make a reservation for us. And I’m extremely glad that we accepted. This trendy, crowded and delightful restaurant serves up some delicious modern Viennese/European cuisine. S and I shared a lovely round of burrata with braised vine-ripened tomatoes and basil. I then had a calf schnitzel stuffed with fresh mushrooms and served with a truffled potato gratin. S had a gorgeous plate of chicken thigh and leg braised in a local vinegar-based sauce and served with polenta. Everything was excellent. The Naschmarkt is Vienna’s main food and produce market. It’s a must-visit for every foodie. It’s basically organized along two long paths, with food and produce purveyors lining the longer one and cafés lining the other. Upon entering Nashmarkt from the north, directly on the left, there’s a small seafood café with both indoor and outdoor seating. Given how bountiful the produce is here, it comes as no surprise that the seafood served here is amazingly fresh. On a warm day, Calamari is, in our opinion, the best place in the Nashmarkt to sit and have some Prosecco and seafood. In S’s case, that meant an open-faced salmon sandwich and a half dozen fin de claire oysters. For me, that meant a half dozen of the most beautifully plump scallops, covered in butter, herbs and garlic and grilled to perfection. This tiny little gem of a shop off the Graben has been serving up perfect open-faced, egg-based sandwiches for generations. Each little sandwich costs Euro 0.80 and all 21 varieties are delicious. You can buy them over the main counter and eat at one of the few tables or standing counters or have the staff pack them for you in delightfully utilitarian boxes. This is a must-visit. My colleague and I wandered into this cute little Greek restaurant located near Karlsplatz because she was having some serious Mousaka cravings. And I’m glad we did. The food here was great. I had a delicious spinakopita followed by an equally delectable lamb souvlaki served with rice and salad. If you’re getting sick of Viennese food, this is the perfect place to go for a break. This is, despite the high prices and the hordes of tourists, obviously a must-visit. Because I had raved about Sacher Torte to S for years, it was especially necessary for us to go. Fortunately, the Sacher Torte lived up to its reputation and S finally understood my predilection for this sweet chocolate cake. By comparison, neither of us liked the one served at Demel. I’ve always loved Café Central. When I was a cheap student back in ’94, I would go there, order one coffee and sit for hours. These days, I can afford a coffee and a slice of cake. It’s a wonderful place to sit for a while and soak up atmosphere. It’s nice that this café is still frequented by the Viennese as much as it is by visitors. The decor is simply beautiful, with ribbed vaulting, columns, marble, wrought-iron chandeliers and plush banquette seating. This dark, smoky café oozes charm and character. Stepping in here is like wandering back in time, to a day when intellectuals would spend their days arguing politics over cups of coffees and cigarettes. Visit the café during the day for a shot of coffee and then come back at night, a little after 10pm, when the buchten (delicious cakes) are seved fresh from the oven. Henny runs a lovely antique and fabric store on Shliefmuhlgasse, a street near the Nashmarkt that has become increasingly trendy. While she stocks a gorgeous assortment of hand-printed kimonos, it was the display case of antiques near the back of her shop that caught our eye. In it, we found some gorgeous items, including the above pictured 19th Century British cutlery set. I knew that the moment S saw these gorgeous dessert forks and knives, with their mother of pearl handles, she’d want to take them home. Coffee machine lovers have got to check out this cute store. Among the brands they stock, they carry a great range of Isomacs and Illy machines. They also sell a good range of coffee. Last year, a courageous German woman named Christa Berghaus-Fölster decided to do something pretty amazing. She bought a company with roots stretching back to 1883. It is Vienna’s last surviving silversmith and silverware manufacturer. In the early 20th century, Vienna produced some amazing silver pieces. But over the decades, most of these silverware manufactures closed down. Christa is devoting her time (and money) to revitalizing this amazing craft. Having gone through the company’s archives, not only has she found blueprints for beautiful silverware and cutlery, but also a small number of actual vintage pieces. She’s been using these historical references to produce brand-new all silver pieces, handmade and cold stamped. The work is stunning. Some of these pieces can be traced back to royal and aristocratic families; others are linked to famous designers who had worked with the manufacture. The pieces, I have to say, are very expensive, but given the quality and historical properties, very much worth the prices asked for. Christa is also open to custom orders. 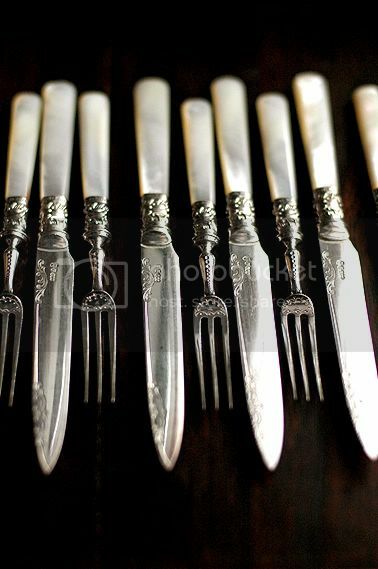 This is, for any silverware freak, like S, a must-visit. This cute little store, sandwiched in the antique store district, sells wonderfully modern women’s accessories, most of which have been cast in hard plastic, designed by Viennese designer Barbara Reisch. She’s crafted some gorgeous and witty necklaces, earrings, bags and other items that female fashionistas will surely drool over. The prices are also reasonable so this is a good place to shop for a nice gift for that special someone. Despite being located smack in the middle of the tourist district, this little wine shop offers fantastic service and great prices. Ask the charming Claudia to recommend some local wines to buy and bring home. I recommend especially the Wachau Rieslings. Chocolate fans should make their way to the Vienna outpost of this Salzburgian chocolate maker. All their chocolates are handmade and are sinfully delicious. Especially recommended are their bars, available in a huge assortment of flavors. As you can imagine, S grabbed several to try. I like best their orange flavored milk chocolate. It has none of the artificiality that so many other flavored chocolates have. We were told at the store that the manufacture uses only freshly squeezed orange juice. I also really liked their strawberry chocolate. While this vinegar producer is based in the 10th district, we visited its small stall in the Naschmarkt. This family owned company sells a great variety of handmade vinegars, flavored oils, wine, juices and mustards. We especially liked the drinking vinegars and the pumpkinseed oil, a Viennese specialty. This cute and (especially on Saturdays) crowded store in the Naschmarkt has a fantastic range of Viennese produce, from meats to preserves, wines, juices and chocolates. Ask Johannes, the charming proprietor, for recommendations and you won’t go wrong. Babette’s, named after the fantastic food film Babette’s Feast, is a wonderful little cookbook bookstore just a short walk from the Naschmarkt. In addition to the great range of books, there’s a small counter which serves snacks, soups and whatever else the owners feel inspired to make each day. Meinl started life as a coffee bar. Now it’s a major gourmet purveyor as well as a huge financial institution (with even its own bank). This glorious, shining multi-storey temple of gastronomy with a fantastic location on the Graben is the ultimate Viennese gourmet’s paradise. There’s a café, an uber-chic and very expensive restaurant, a wine bar, a sushi bar, and a supermarket stocking over 13,000 products from all over the world. This is a great place to spend an hour exploring. S went nuts in this shop. Located just around the corner from Café Central, in the Freyung Passage, is this great little store that stocks chocolates from all over the world. You can get artisanal chocolates, cocoa powder, cocoa nibs and a number of other delicious chocolate products here. Come to stock up on those hard-to-find brands that you’ve always wanted to taste. Welcome back to Singers! So so envious! And the silver cutlery is just gorgeous! I was so drooling over them. 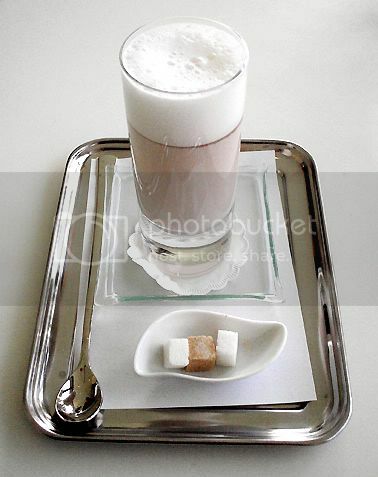 ooooh… the glass of warm milk looks like a really nice and comforting drink! And now to definitely buy a plane ticket with this guide in hand…thank you! excellent post, seeing that i’ll be heading to vienna in june! one question: does not knowing german impede one much when eating in restaurants (or travelling around in general) in vienna? Hi Aun, Can’t believe you guys stayed at Hotel Altstadt – this is were I usually stay for business when traveling to Austria, Vienna for that matter. Their rooms are all charming and some have super high ceilings. We also just recommended it to friends for a wedding in August… ‘Glad you had such a good time in Vienna! MM: Thanks. Yah, we love the new forks and knives. Phenomenally well-priced and in perfect condition. Anonymous: The milk was good (I stole a sip from S) but it was amazingly rich. J: We’re really glad that you liked the server. We kept going back and forth between WSW and Dorotheum, Vienna’s top auction house, that has a fantastic first floor consignment shop, trying to decide what to get for you. Cath: Watch out, the celebrations for Mozart’s 250th birthday start in May and I hear prices all over the city are shooting up. Oliver: What a coincidence. It’s a great hotel. Truly fantastic! Your review of Steirereck has inspired me to visit. You say that you enjoyed it more than GR, this I can believe, as you know I think Gordon has lost his flair. We went to Maze (another Gordon venture) last night and to be honest I was not overly impressed. Your guide to the city is fabulous by the way. What a nice, concise (directed) guide. Did you manage to snag any of the 10:00 cakes? We stopped by one night but were, sadly, denied the pleasure (they were gone!). Glad you enjoyed your experiences in Austria– do you speak any German, by the way? Your guide is very thourough, colourful and interesting; it makes me want to visit Vienna very soon!!! that looks like an amazing trip, i’ve heard so much about vienna and all that’s standing in my way right now is logistics! i love your blog, by the way. did you see the strudels being made? 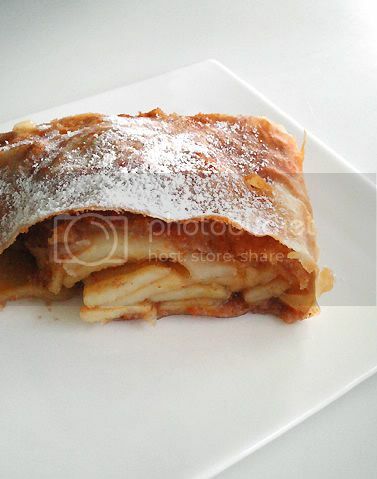 i made strudel (only once) at baking school and it was great fun stretching the delicate dough and rolling them up using a huge floured sheet. i must say i should have went to Vienna after reading your post on Vienna Guide! am not very sure of the places that you mentioned here, but am pretty sure i tried out hotel sacher famous chocolate cake and were pretty disappointed with it. i think basically we were expecting it to be very rich chocolatety! but it was unique in it’s own way. Have you tried out the famous chocolater wafer maker “Manner” located right beside St.Stephenplatz? If you like Tafelspitz, you gotta try the “Tafelspitz mit grüner Soße” (with green sauce) from Frankfurt where I live. If you ever have a connecting flight there, u should take a day to discover local specialties. Gastrochick: Cheers. I hope you can make it there soon. Houska: Honestly, not on this trip (I’ve had them before). We kept meaning to, but kept getting distracted with other things (i.e. other desserts in other places). Um, I speak a tiny amount of German. I was in Vienna back in ’94 to do a 1 month intensive German class. Rosa: Oh, lucky you. The rumor around Singapore is that Sacher is opening a cafe here soon. I can’t wait. Vanessa: No, I didn’t. Sounds like great fun though. Anonymous: I like that it’s not too rich. As someone who is not really a big chocolate fan, it’s one of the few chocolate cakes I enjoy. S did comment that most Viennese cakes seemed a tad dry to her. The Manner shop, all dressed in pink, is awesome. Yah, we went and bought a few snacks. Plus, the Altstadt offers a bowl of Manner caramels that are free for visitors. Felix: Damn! I flew back via Frankfurt. To be honest, I’ve been to Frankfurt countless times, but only to the airport — which I really, really don’t like. Maybe one day, I’ll get out and hunt down the Tafelspitz with green sauce; sounds yummy. Free Manner Caramels? I must have been BLIND! i was there twice in 3 days. argh! :O …you speak germans? that is so totally cool! it’s not difficult to travel ard Vienna w/o speaking their language. but knowing a few lines of German is an added bonus! I don’t know if this is at all related to the Sacher Hotel, but the website says it’s due to open in March/April. Hey S, just realised this … Happy belated B-day! And thanks for the tip. Will watch out for it! 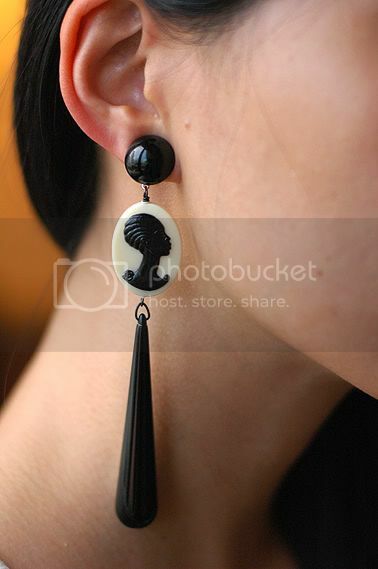 Love those earrings! Simply divine! What a shame I have not read about this post before I left for Vienna. I was there two weeks ago and it would have been useful to have some of your recommendations. I agree that cakes at Demel are not that great, even though I did not try their Sachertorte, but I did enjoy the Melange everywhere in Wien. Cannes: The free caramels were at the hotel I stayed at, not the shop 🙂 Yah, I have to admit even the (very) few words of German I speak helped a lot. Jellygirl: They are cute, huh? They also had a range with an old chinaman’s face (complete with chinese hat and goattee). Very kitsch but very funny. Very thorough guide! I am planning to visit Vienna in a couple of months and your guide will come very handy. Thanks for sharing. Frankfurt airport is definitely not comparable to Hong Kong for example. But from a culinary point Frankfurt has a lot to offer. Besides the traditional cuisine (green sauce for ex. ), there is are some high-class locations like the Silk bed restaurant at Cocoon club (article on my brothers blog=> http://blindtasting.twoday.net/stories/1764118/ ) or Amador near Frankfurt which could be the German “El Bulli”. I will be coming to Kuala Lumpur soon and stay for 7-8 months. Do you possibly have any restaurant recommendations? Have you been to “Meinl am Graben” – a very nice store to shop delicious goodies? If not, come back to our beautiful city. I linked into your blog through Cream Puffs in Venice, and boy am I glad I did. This Vienna info. is just what I was hoping to find before I visit this December (hey, you can never start planning too early, can you?) Thanks for such a thorough write-up and suggestions. I hope to get to some of the places you mentioned in my four days there.